If there was any question about Sergei Zborovskiy’s allegiance heading into the Canada Russia Series, he’s putting it to rest. The 19-year-old defenceman is all business as he prepares to face Team WHL on Monday in Prince George and Tuesday in Edmonton, even though the competition includes three Regina Pats teammates. Connor Hobbs, Sam Steel and Austin Wagner are all slated to oppose Russia in the two-game showdown, but Zborovskiy doesn’t expect to exchange pleasantries — or any other form of banter — with his Pats’ pals. The same goes for Hobbs, who took a slightly more lighthearted approach to the matchup with Zborovskiy. He also admitted there has been some pre-series posturing on his part. Hobbs is a candidate for Canada’s world junior team after participating in the summer development camp and exhibition series. He’s off to a nice start with Regina this season, sitting among the WHL’s top-scoring defencemen with four goals and 18 points in 13 games. Hobbs could solidify an invitation to Canada’s upcoming tryout camp with a strong performance against Russia. Ditto for Zborovskiy, who played in last year’s Canada Russia Series and was invited to his country’s world junior selection camp. He ended up as one of the last cuts. The last one is easier said than done. Russia will presumably be looking for players who can adapt to the smaller ice surface at the world juniors in Toronto and Montreal. That scenario favours Zborovskiy, who’s in his third season with the Pats, but he doesn’t think it’ll be a huge factor. Pepsi Center on Sept. 23, 2009 in Denver. If you’re ever scouring the NHL record book under the goalie section, page 662, you’ll find a clean sheet for Sherwood Park’s Tyler Weiman — 16 minutes played, 10 saves, goals-against average of zero. “Yeah, not many goalies can say I had perfect stats,” Weiman says with a laugh. Weiman, 32, now minding the nets in South Korea for the Daemyung Killer Whales in the nine-team Asia Hockey League — the same league in which former Oilers Alex Plante, Bryan Young and Brock Radunske play — never dreamed he’d be playing so far away and living at the sparkling international business district of Songdo, near Seoul. It sprung up from nowhere on 1,500 acres of landfill on the Incheon waterfront. “They have a replica of Central Park in New York there,” said Weiman. It’s also where they filmed the music video “ for the hit song Gangnam Style with its 2.6-billion YouTube views. But we digress, just a bit. Weiman, son-in-law of Simon Sochatsky — who was part of the Oiler ownership group back of Cal Nichols-Bruce Saville-Jim Hole days — has been an everywhere man as a goalie, starting in junior with the Western Hockey League’s Tri-City Americans. Fellow Sherwood Park goaltender Cam Ward and Weiman were together in Lowell with the Loch Monsters in the AHL in 2005-06. Weiman was in Winnipeg with the AHL’s Manitoba Moose and shared duties with Eddie Lack. Ward and Lack are the Carolina goalies today. Weiman, drafted by Colorado in the fifth-round in 2002, backed up for 25 to 30 NHL games, including some playoff work, but played only one league game in October 2007, replacing Peter Budaj, who had the Avalanche start because Jose Theodore couldn’t go. “Nashville’s home-opener that year,” recalled Weiman. Weiman, who has his commercial real-estate licence, played 200 WHL games and 215 in the American Hockey League — mostly in Lake Erie (Cleveland), with stops in Lowell and Manitoba — and four stops in Europe (Augsburg, Nuremberg and Landshut in Germany and Val Pusteria in Italy). He went to Europe in 2011, listening to players who told him he’d love the money and lifestyle. He was tired of beating his head against the wall as an AHLer. He knew in his heart of hearts, he was an NHL call-up guy for a game or two, no matter how he looked in camp. He never had a save percentage less than .903 in the AHL and was a starter, but it didn’t matter. Plus, he was 5’11” and not 6’2”, the average NHL goalie height. Then South Korea beckoned and he signed a two-year contract. Korea’s hosting the 2018 Winter Olympics and they’re trying to build a team that’s quasi-competitive, constructed of Korean-born players and Canadians with Korean citizenship like Radunske (Anyang Halla) and Young (High 1), who’ve been there long enough to qualify. And probably Plante after this season. American winger Mike Testwuide, who played in Philly’s farm system, also has Korean citizenship. Weiman would love to do the same, but might not have the chance. Canadian-born goalie Matt Dalton, a former Boston Bruins farmhand who played with Nail Yakupov in the KHL for one season, also as the inside track. He plays for the powerhouse Anyang Halla with Plante and crew. “He’s pretty good and he’s a top player on the top team,” said Weiman. But Weiman says he’s having a fantastic time over there, playing for the Daemyung Corporation, a conglomerate into resorts. Weiman, of course, will be the NHL tour guide. He’s actually been in NHL rinks and not as a fan, although he was Rogers Place in the seats to see Craig Anderson, a former member of the Avalanche, this past week when Ottawa was in town to play the Oilers. “What we’d like to do as a team is come over to Edmonton for training camp (next year). Chance to see the best building in the NHL and maybe our team can play teams like NAIT,” said Weiman. For now, though, there’s the 48-game season in Asia with the nine teams. Three in South Korea, four in Japan, one in China and one in Russia (Sakhalin Island). Owners with lots of money who don’t care that attendances at games are often somewhat less than crowds. Or that, while South Korea is a major short-track, speed-skating country, hockey is a novelty to many. The players are fast but small, not overly physical, but they’ve got good skill so national team coach Richard Park, the ex NHL forward, will have enough Korean-born players to fill at least half his Olympic squad. The league, over the years, has also had NHLers like Esa Tikkanen, Jamie McLennan and Tyson Nash on their teams—deep into the back-nine of their pro years, but hockey’s not a big draw even the league itself with the money offered to foreigners is very good, along with living facilities. It isn’t the NHL, but it’s not the American League either. No bus rides. Only 48 games, but tough ones for a goalie. “I think I’m averaging 47-48 shots a night. I thought I was unbelievable one game, and we lost 6-0, but that’s the way it is,” said Weiman. The Killer Whalers play in a 5,000-seat rink with a video scoreboard, lots of comforts. But if they draw 1,000 a game, it’s big. As much as speed-skating in a hockey-size rink with boards is very popular there and the country’s won 17 Olympic gold medals, hockey is not. The owner gets some nice tax breaks and the team gives tickets away. “You could be a block away and people wouldn’t know there’s a hockey game on,” said Weiman. That said, the players are treated royally and he loves being over there to embrace a different culture. And where he lives, you can’t beat it. It’s the largest private real estate development in history. They’re building 80,000 apartments, five million sq. metres of office space and 900,000 sq. metres of retail. Computers are built into buildings and street lights for video conferencing with neighbours. Wide streets, no crime. “It’s one of the safest places you’ll ever see,” said Weiman. 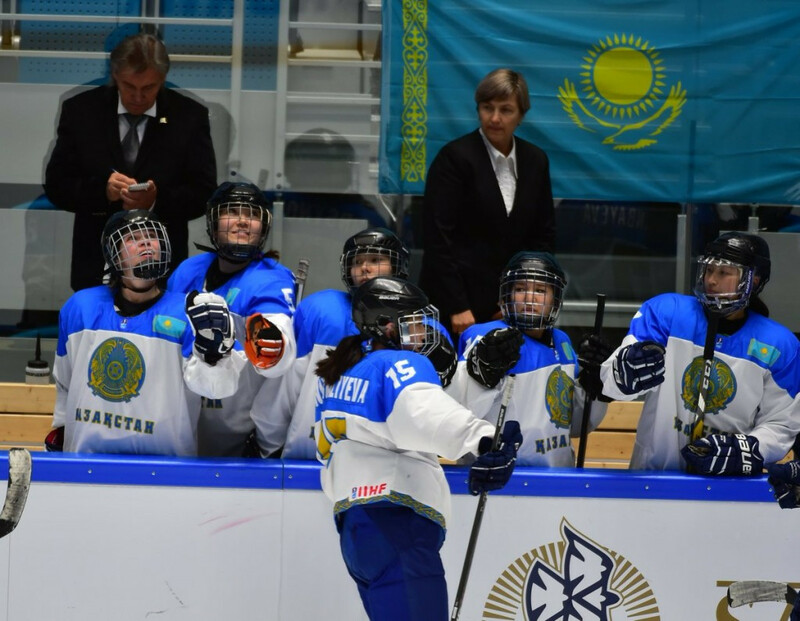 Kazakhstan advanced to preliminary round three of the Pyeongchang 2018 women’s ice hockey Olympic qualification phase after earning their third straight victory in Astana today. Victories in their opening round two matches over Poland and Mexico had boosted the host nation’s chances of making the next stage of the qualifying process. A third triumph of the group would seal their place in round three, the penultimate stage of Olympic qualifying. Britain hoped to give their rivals a strong test at the Barys Arena, but Kazakhstan took control of the tie in the opening period with Galia Nurgalieva and Daria Moldaba giving them a 2-0 lead. Katie Henry pulled one back for the British team in the third period of the match, but Tatyana Likhaus restored Kazakhstan’s two goal lead to give them a 3-1 win. While Kazakhstan won the group to progress to the next phase, Britain ended in third place after Poland recorded a 5-0 victory over Mexico in their final match. The host nation will now begin preparations for next month’s third round, when they will travel to Stavanger to face hosts Norway, Hungary and Slovakia. The winners of the group will then advance to the final qualification stage for Pyeongchang 2018. Italy also kept their Olympic hopes alive after beating the Netherlands in Group H today, with the result seeing them reach the the third round. Both teams had already earned two victories in San Sebastian ahead of their clash, but the Italians earned the one available spot in the next round by triumphing 5-1 in their meeting. Hosts Spain and Slovenia will meet in a dead rubber later, with neither side having a chance of qualification. China, France and Latvia will now face Italy in Group E, when Olympic qualification continues next month. The 2016 Deutschland Cup came to a close on Sunday with Canada defeating Germany by a score of 3-1. Earlier in the afternoon, Slovakia finished off their tournament with a 4-1 victory, getting the victory they needed to secure the tournament title. Their victory against Canada on Saturday was going to make things tough for the Canadians even if Slovakia lost on Sunday, but it wouldn`t matter in the end of the three-day tournament. Even though they knew they didn’t have much on the line outside of pride, Canada wanted to finish with as many points as possible. fTheir bid for that goal started off early with the first mark on the goal sheet at just 5:23. Nic Peterson made a good move to send the puck to Kevin Clark, and one of Canada’s top players made the most of it by firing it glove side on Niklas Treutle and in for the 1-0 goal early. While Daniel Taylor was playing well in the Canadian net, his team in front of him was doing quite the good job to put Canada far ahead in the lead. At 17:24, Brandon Kozun passed the puck out in front to Jonathan Sigalet, who then sent the pass to Derek Roy. Roy was in a great spot to send the puck into the net, giving Canada the 2-0 lead. Then, at 18:11, Canada would make it 3-0. This time, Clark would get his second of the game after rushing into the zone and firing the hard wrist shot past Treutle and in to give Canada the sizeable lead heading into the first intermission. Canada`s hope of finishing the game off with a shutout came up short. At 5:49, Thomas Greilinger picked up the loose puck in a bit of a scramble in front and shot it at net, only to have the puck bounce off of Canadian Jesse Blacker in front and in for the 3-1 goal. It wasn`t enough to spark a comeback, as Taylor held strong in the net and Canada kept their 3-1 lead to take second place in the 2016 Deutschland Cup.